First prepare the soufflé dish by completely buttering the inside, edges and rim of the dish with 1 Tbs of unsalted butter. In a small bowl combine ¼ cup of sugar and the sifted cocoa together and pour into the soufflé dish. Rotate the dish to coat all the sides, the rim and bottom of the dish in the cocoa/sugar mixture; discard any excess and set the dish aside. To make the soufflé whisk off the heat in a small sauce pan the 5 Tbs of flour, ¼ cup of sugar and the salt. When combined well add the milk and whisk off heat until no lumps remain and the mixture is smooth. Place the saucepan on the heat now over high heat whisking constantly. The mixture will thicken at around the 3 minute mark and quickly and it will begin to pull away from the sides while you are constantly whisking. As soon as it starts to pull away remove it from the heat and pour the mixture into a medium bowl and whisk in the 2 Tbs of room temperature butter. When the butter is fully whisked in then whisk in only the egg yolks until incorporated. Then, using a rubber spatula mix in 3 Tbs of Grand Marnier and the orange zest until just combined. In an electric mixer on medium speed using a whisk attachment add 5 egg whites and whisk for 10 seconds and then add the cream of tartar and half of the sugar. Then turn the speed up to medium-high for 2 whole minutes then with mixer still on medium high add the remaining sugar and continue whisking until soft peaks form about another 30 seconds and turn off the electric mixer. Take 1/4 of the egg white mixture and stir it into the soufflé mixture until combined using a rubber spatula. Then using a balloon whisk, fold in the remaining egg white mixture being careful to keep the mixture light by not “mixing” but carefully folding in the egg white mixture until just combined together with the whisk. Pour the combined mixture into the prepared soufflé dish and bake for 20 to 25 minutes. Do NOT open the door of the oven for the first 15 minutes or the soufflé will fall. 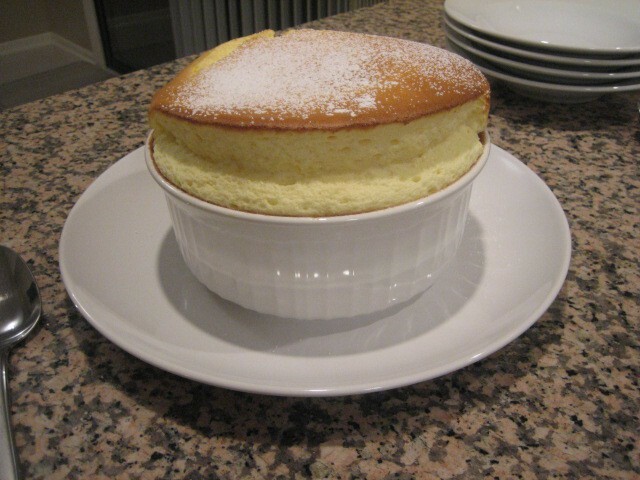 After 20 to 25 minutes the soufflé will develop a brown crown, raise 2 to 2 ½ inches above the rim and is ready when the dome jiggles slightly in the center when moved. Remove the soufflé from the oven, sprinkle with confection sugar and serve immediately. The soufflé will have a lovely creamy center.